← Caramelized Garlic Bread, For The Last Time! And here we are. It’s the very last bread of the year. I’ve made sure to leave you with a good one, too. 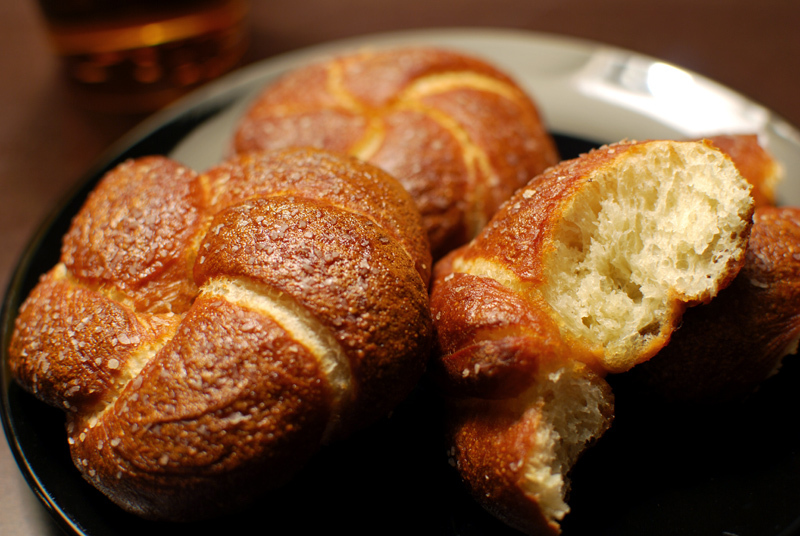 When I first made these pretzel knots, I was intrigued by the excellent flavor of both the dough and the poaching liquid, though the rising method left quite a lot to be desired. I’m not entirely sure why the original recipe directed the cook to refrigerate the rising dough for a shamefully short time (less than an hour), but my dough rose hardly at all that way. By the time I’d realized that the specified method would never work in my kitchen, my dough was well and truly chilled, and it took ages to come back to room temperature. The only reason I can pinpoint for the use of such a technique is that the recipe comes from a restaurant in Las Vegas, where high-altitude rules (such as refrigerating dough to slow yeast activity) would certainly apply. 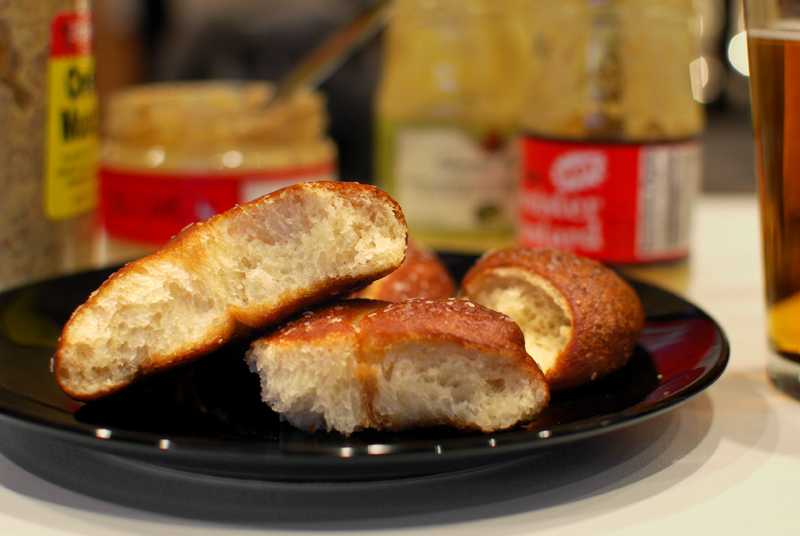 The result of the first attempt at this recipe was slightly disappointing, as the pretzels were extremely flat, but it held great promise, as they were nonetheless fluffy-textured and flavorful. When I tweaked the rising method to better suit my nearly-sea-level kitchen, the bread that resulted was shockingly good. With the same complex depth of flavor that had convinced me to try it again, this second batch had a much better and rounder shape, with a cheerful loft to the crumb that teetered impossibly between fluffy and chewy. Pulling one apart, the dough resisted with a perfect tug that melted into a creamy softness on the tongue, the hallmark of any well-crafted bread. 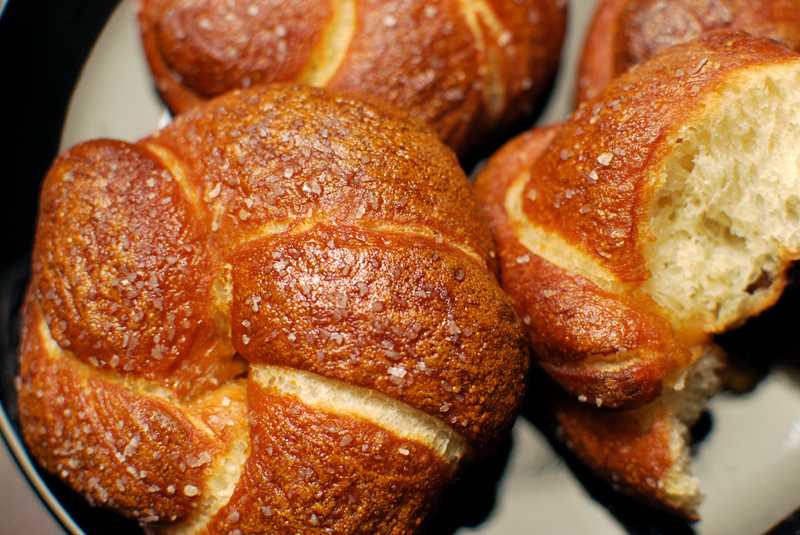 The subtly and pleasantly metallic notes imparted by the poaching liquid reaffirmed its formerly-conferred status as my go-to mixture for any pretzel; but this time, the pretzels themselves convinced me to make this dough my go-to recipe. I tried serving these pretzels with mustard, because, you know, that’s just what you do; but after a few bites, I put the mustard away. Mustard here is a disservice, and I have never said those words before. I love, love, love mustard, especially mustard on a soft pretzel. Even more especially good mustard on a homemade soft pretzel. But mustard on these things actually detracts from their phenomenal flavor; it covers it up and makes it taste merely great, instead of mind-blowingly incredible. Hyperbole? Hardly. It’s the last bread of the year, and I wasn’t about to leave you with anything less. PS – Beer is still a go with these. 1. In the bowl of a stand mixer, whisk together the flour, sugar, salt, and yeast. Add the water, buttermilk, and oil. Using the dough hook attachment, mix on low speed until a rough dough forms. Turn off the mixer, and without removing the hook or the bowl, cover loosely with plastic wrap and let rest for 15 to 20 minutes. 2. Remove the plastic wrap. Turn the speed to medium-low and knead for about 5 minutes, or until supple and smooth. The dough should be sticky. Transfer to a large lightly-oiled bowl, and let sit at room temperature until nearly doubled in size, 1 1/2 to 2 hours. 3. Line a large baking sheet with parchment paper. Turn the dough out onto a lightly-floured work surface. Gently deflate, and divide the dough into 8 even pieces. Keeping the unused pieces covered loosely with plastic wrap, roll each piece into a long rope, about 8 to 9 inches long. Tie the ropes into single or double granny knots. Transfer to the prepared baking sheet, and cover loosely with lightly oiled plastic wrap. Let sit at room temperature until puffy and risen, but not necessarily doubled in size, about 1 1/2 hours. Thirty minutes before baking, preheat the oven to 450º F.
4. To prepare the poaching liquid, combine the water, beer, baking soda, and sugar in a medium to large pot. Bring to a boil over high heat, then reduce the heat to about medium, or hot enough to keep the liquid at a lively simmer. Cut the parchment paper between the pretzels so each rests on its own square. Line a second large baking sheet with parchment paper. 5. Gently lifting by the paper, lower each pretzel into the boiling water, removing the parchment as soon as possible. Poach pretzels for about 20 seconds on one side, gently turn over, and cook for about 20 seconds more. Transfer boiled pretzels with a skimmer or slotted spoon to the second baking sheet, letting the liquid drain off well before setting each down. 6. When all the pretzels have been cooked, let cool briefly, 5 to 10 minutes. Brush gently and evenly with vegetable oil, and sprinkle generously with salt. Bake the pretzels at 450º F for about 15 minutes, or until deeply browned. Transfer to a wire rack to cool completely. Serve warm. 1. Don’t store pretzels in an airtight container, as the salt will make them shrivel. Pretzels can be stored at room temperature, uncovered, for about 1 day. Remaining pretzels should be frozen in an airtight container (such as a zip top bag), and reheated unthawed in a 350º F oven for 5 to 10 minutes, or until heated through. 13 Responses to Pretzel Knots, For The Last Time! Wow, those look really good… do you have a preference for the type of beer you use in the poaching liquid? Congratulations! What’s next for you? Patrick: It really doesn’t matter what type of beer you use. The original recipe specified “amber beer”, and I used something that I happened to have on hand that reasonably matched that description; my general rule of thumb is to not use anything too nice when cooking with beer, as much of the flavor subtlety is lost. My usual cooking beer is Old Style or Pabst Blue Ribbon, inexpensive beers that I wouldn’t normally drink alone, but aren’t entirely tasteless, either. Whatever you prefer will work beautifully. Try different kinds and see what happens! Drea: Thanks! I am planning to launch a new blog very shortly… as soon as I settle on a name. Argh! Any suggestions? Drea: It’s going to be a fairly generalized cooking/food blog. I’m itching to try about a thousand different recipes of all different types, after focusing so intensely on one kind of food for a year. I’d really appreciate any suggestions! I am tripling this recipe. Do I need to triple the poaching liquid as well? seems like there would be enough to poach many more pretzels than 8. Also, on which rack (top or bottom?) do you bake your pretzels? I baked a test batch on the bottom rack and they pretzels were a tiny bit burned on the bottom. Sara: No, there should be plenty of poaching liquid to go around. You might need to top off the pot with a little extra water now and then, as it does tend to evaporate a bit while poaching the pretzels. Good luck, and happy baking! I’m jealous of all the pretzels you’ll have!